The Hypermotard 939 is a stunning looking bike that is also a joy to ride. 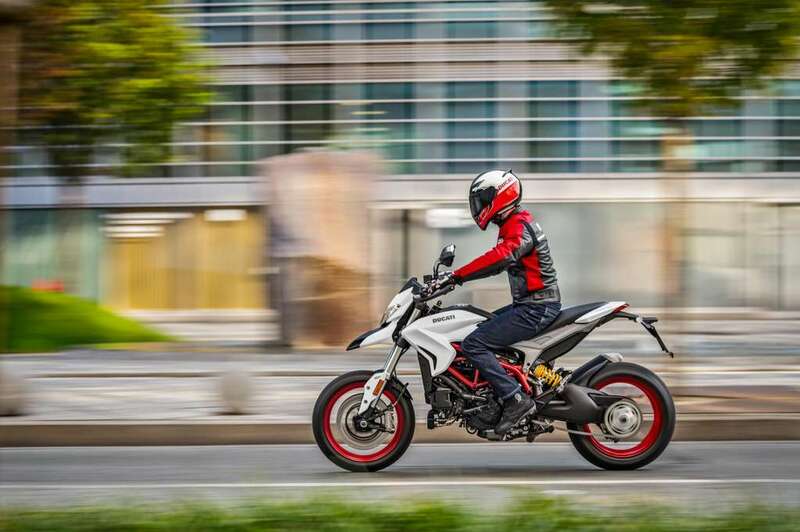 In its hand protectors, more typically fitted to off-road models, the Hypermotard 939 integrates LED turn signals in order to blend in perfectly with the model’s clean design and the need to use it in the city. The attention paid to the flow of the lines has allowed an essential and minimalist image of this family, despite the bikes’ complex water-cooled engine and thoroughly modern technology. The Hypermotard 939 family therefore stands out because of its proportions, ergonomics and practicality, besides being equipped with the latest Ducati technology. The Hypermotard 939 and Hypermotard 939 SP faithfully maintain an essential Supermotard look. 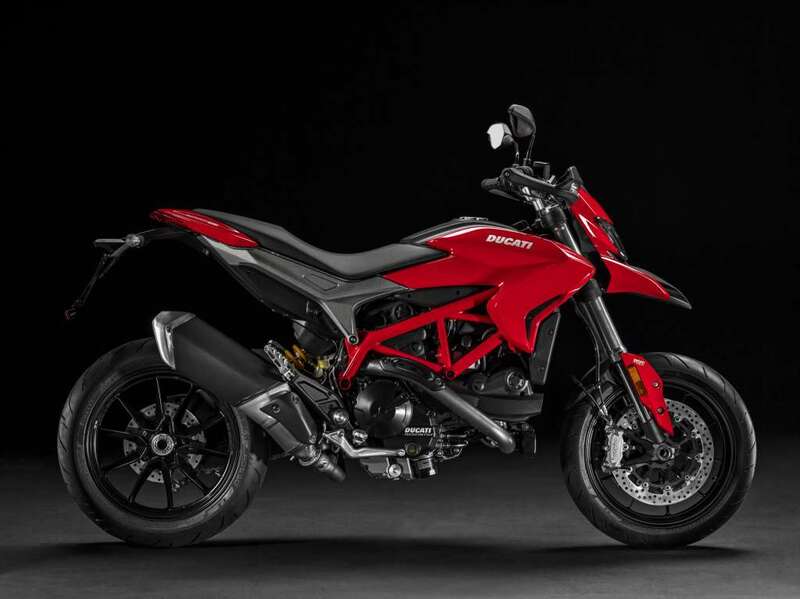 The Hypermotard range was renewed for 2016 with the arrival of the new EURO 4 certified 937 cm3 Ducati Testastretta 11° engine. This twin-cylinder is to be used for the sporty Hypermotard 939 and the extreme Hypermotard 939 SP. From the moment it was first presented as a concept bike at the Milan show in late 2005, the Hypermotard prototype was an immediate success. 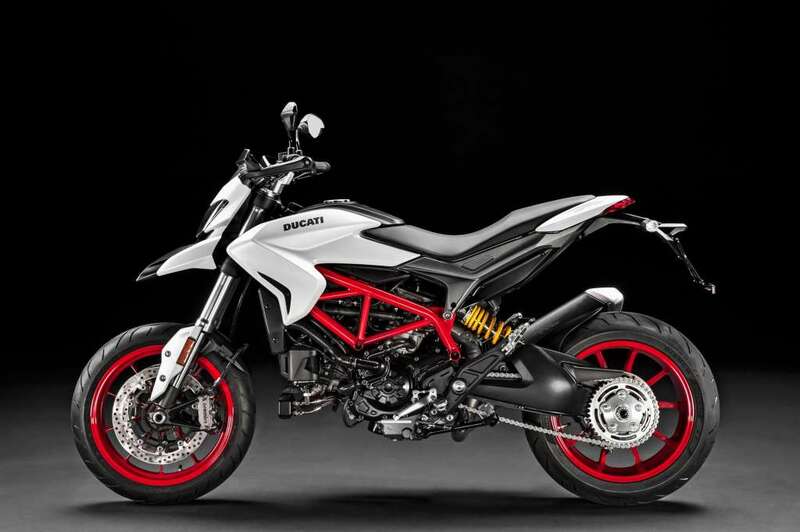 Production began in 2007 with the 1100 and 1100 S models and in 2013 the Hypermotard underwent great changes. A whole family was born from the one bike, powered by the 821 cm3 Testastretta twin-cylinder which has now grown to 937 cm3. The new 937 cm3 Ducati Testastretta 11° engine guarantees a maximum power of 113 hp and most of all a 10% increase in torque. This twin-cylinder, which has an oil-cooling radiator, is attached to the steel tube Trellis frame that made the Hypermotard famous. The range is equipped with the Ducati Safety Pack which includes a 3-level ABS, 8 levels of Ducati Traction Control and 3 Riding Modes. Each Riding Mode has different electronic settings in order to provide the Hypermotard with three different personalities. The Hypermotard 939 SP has a livery inspired by the MotoGP, a weight of 178 kg and at the front a fully adjustable 50 mm diameter upside-down Öhlins fork with 185 mm travel. The rear suspension uses a fully adjustable Öhlins shock absorber which allows for 175 mm rear wheel travel. The raised ride height of the SP version allows for a 47.5° lean angle, essential for extreme race-track riding. 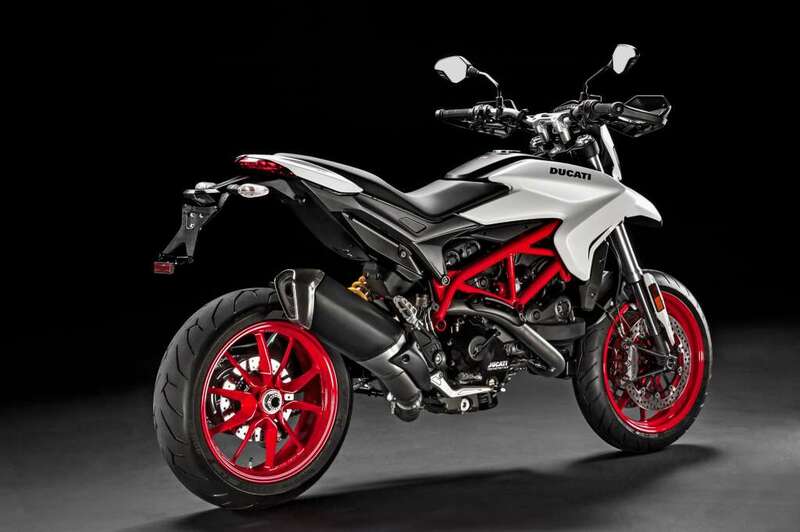 These specifications take the ride height of the Hypermotard 939 SP to 890 mm. A 20 mm lower saddle is available as a Ducati accessory on request. 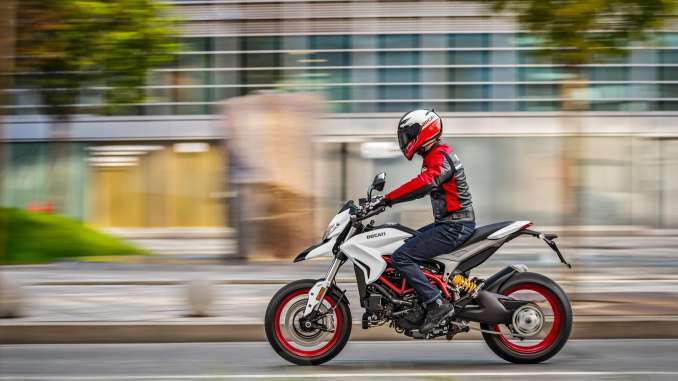 The Hypermotard 939 SP uses Pirelli Diablo Supercorsa SP tyres. Included as an integral part of the Ducati Safety Pack (DSP), the Hypermotards are equipped with the Bosch ABS 9.0MP controlled Brembo braking system, an impressive combination of state-of-the-art security and proven performance. Shorter stopping distances with enhanced stability are vital prerequisites for all motorcycles, but adding full Riding Mode integration takes Hypermotard braking to the next level. The Hypermotard 939 and the Hypermotard 939 SP use a 3-level system: level-1 enables a track-oriented front only ABS and level-2 delivers high braking performance with reduced rear lift-up prevention for sport-oriented road use, while level-3 provides the most braking stability with maximum lift-up prevention. The front brakes use twin radially-mounted Brembo, four piston, Monobloc M4-32 callipers actuated by a master cylinder with a 4-point adjustable lever on the Hypermotard 939 and 5-point on the high performance radial master cylinder of the SP. The fronts grip 320 mm discs, while a single 245 mm disc on the rear is gripped by a single Brembo calliper. Typical of all Ducati motorcycles, these components ensure high performance braking and set the standard in this segment. Exhaust Single stainleess steel muffler with catalytic converter and two lambda probes. Single stainleess steel muffler with catalytic converter and two lambda probes.